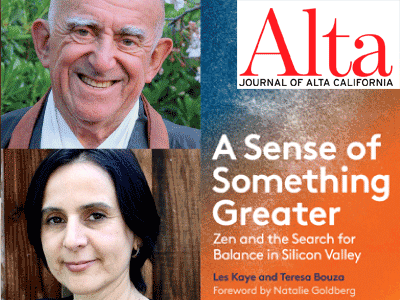 Kannon Do Zen Meditation Center instructor Les Kaye and journalist Teresa Bouza discuss their brilliant collaborative guide, A Sense of Something Greater: Zen and the Search for Balance in Silicon Valley. With worker stress at an all-time high, particularly in the fast-paced technology industry, it's no surprise that Google, Salesforce, and Apple have adopted mindfulness and meditation into their workplace culture. Studies show mindfulness practice increases emotional intelligence, reduces stress, and enhances health and overall well-being. A Sense of Something Greater goes deeper than the current mindfulness trend, into the heart of Zen practice. For Les Kaye, Zen is more than awareness--it's also "the continued determination to be authentic in relationships, to create meaningful, intimate, intentional bonds with people, things, and the environment." Kaye's teachings are paired with interviews with current tech employees and Zen practitioners, conducted by journalist Teresa Bouza. A Sense of Something Greater is an essential book for business leaders, mindfulness meditators, and Zen practitioners alike.